Sometimes the journey is more important than the stories. Short story collections are interesting to me, because unlike novels and even unlike most short fiction publications, the organization of the stories tends to be equally important as the stories themselves. Having read many different single author collections, I'm not sure that there is a "right way" of doing it. For some, the best way to present their stories is without comment or clarification, as just the texts without further adornment. Others choose to link their stories into a sort of continuous narrative by adding additional text or structure. Some separate stories by theme, or by genre. 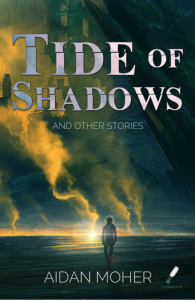 Tide of Shadows and Other Stories decides to organize based on time, on when they were written, to create an overarching narrative not centered on the stories themselves, but on the author's growth as a writer from story to story. It is certainly a brave tactic. Because it does go ahead and show stories that are rough, that are ambitious but that I feel don't quite succeed. "A Night of Spirits and Snowflakes" and "The Girl with Wings of Iron and Down" are both interesting stories, with some neat hooks and plots, but they didn't quite come together in a way that I found satisfying. The endings are a bit soft, a bit muddy, and though they both sound nice, have some good moments in them, they come off as somewhat disappointing. At least, without the commentary. And here is where I'd make the argument that they fit quite well into the narrative that the commentary establishes. That here is a writer starting out. Influences are a bit obvious and the writing in general feels like it wants something without quite knowing how to achieve that. But it is earnest and it is trying and it has moments of clarity that make the stories interesting to read, especially in the context that the author gives at the end of each. And I think it was a good move to frame the stories in this fashion, as a sort of personal growth for the author in his writing, for the story of him discovering more his voice and his focus. The third story, "Of Parnassus and Princes, Damsels and Dragons," is a much more confident piece. It's a bit more trying to do its own thing, trying to be funny and yet make a point. It shows the same ambition of the earlier work but a little bit more willingness to branch out. Of course, I also think that it's still not quite there when it comes to saying what it means to. I can see in it a desire to tell a story that subverts the fantasy fairy tale trope, that presents a happily ever after that would never make it at Disney. The characters are unlikable and unapologetic, and that can be refreshing. They are also not straight, which is also something to cheer, except that they're queerness and their awfulness seemed linked in a way that made me a bit uncomfortable about the story overall. Again, it's easy to see the author trying, taking chances, and while the result can be a bit rough, I still found things to pull out of the stories. And even that roughness becomes part of the writing process, another instance of learning and moving forward. Which, I will admit, made me enjoy the collection as a whole even as I wasn't particularly thrilled by most of the stories. Though the last two, "The Colour of the Sky on the Day the World Ended" and the titular "Tide of Shadows" did show a marked improvement over the earliest stories. Both show more of the confidence that marked the twisted fairy tale but with a bit more subtlety and complication. The stories all show a good eye for ideas, but with the later ones there is more of a payoff, more satisfaction in reading, even on those that end right where another story begins. They bring the characters to a more solid footing, exploring them much more than the stories at the beginning of the collection. In the end I think the project is successful at framing a narrative of the author's growth through the combination of the stories and the commentary provided after each entry. The fiction is interesting but rough, even the final entry showing that while the author has developed much more his own voice and style, that there is more journey yet to come. It is a fascinating read, though, because I can't think of too many projects like it. It keeps things short, not bogging the experience down over a great many stories, and it brought me as a reader on a journey, stopping to admire some neat worlds but mostly showing how it is a writer develops, the kind of work that goes into becoming a better writer. This collection makes me curious to see what a collection from the author will look like in ten years. Or twenty. Until then, it's an interesting project.